Hindsight is 20/20. Or so we’re told. Funny thing, though. We don’t seem to ever learn too much from history. Seems hindsight might be a bit hyperopic. Foresight is tricky. Or so we’re told. Funny thing, though. We don’t seem to ever follow much of the leading of the wise. Seems foretelling is bit myopic. I don’t need any kind of prophetic gift or seer anointing to tell you that you are not going to win the lottery. But, like the girls in, He’s Just Not That Into You , we keep thinking we are the exception. Whether speaking about individuals or nations, we mostly think that the rules of the future just don’t apply to us. The lessons of compound interest are a bit to far ahead for us to focus on, yet we overlook the same investment lessons of our ancestors. However, despite hindsight telling me I’m wrong and foresight telling me that no one will listen, I shall forge ahead into the unknown. This blog is about pattern, so the way we are going to look into the future is through pattern. The pattern of the past tells us what the future will bring. Remember that sight stakes a claim, so if you see the future, you have a claim upon it. History, as shown through the scriptures, gives us a list of forerunners – people who came to open the door of truth in order that we might glimpse what is to come. These are forerunners of the changing of the ages, people who demonstrated what the following age would entail. Adam was an example of the impossibility of keeping the commandment, of fulfilling the requirements of law. He was sent out from the land of his father (Eden, the garden of God) in order to claim his destiny. His life declares a birthing, a beginning. The example of Adam is fulfilled by Abraham two thousand years later. Abraham left the land of his father to lay hold of his destiny. Abraham gave birth to a people who could not keep the law. In addition, Abraham and the patriarchs were forerunners of what was to come. Abraham is called the father of those that have faith. The patriarchs demonstrated patience endurance to claim the promise of God. Their lives declare death, a laying down of one’s own agenda for something greater. 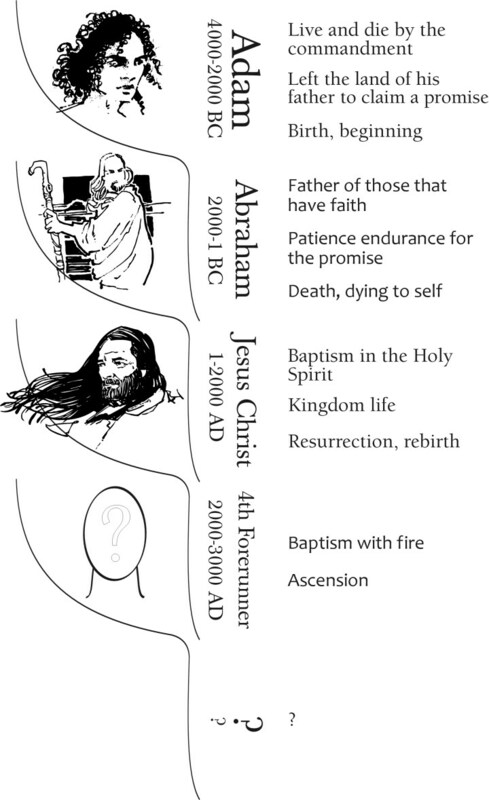 The example of Abraham is fulfilled by Jesus Christ two thousand years later. Jesus demonstrated the death of desire, a life of patient endurance, in order to lay hold of a greater promise. Jesus brought the faith that can make you a child of God. Jesus and the apostles were also forerunners of what was to come. They showed the power of those baptized with the Spirit of God. They demonstrated what it was like to live a kingdom life. Their example was about resurrection, the rebirth that follows the death of desire. It is now two thousand years after Jesus Christ. We will once again see people raised up to fulfilled what was prophesied, as well as demonstrating what is to come. Their lives will show off what it is to be baptized with fire. Their lives will demonstrate the promise of ascension, of what knowing God really means. The winding down of the church age. The church movement will become more inward focused as the blessing that has sustained the church is lifted now that its time is over. Don’t think I am condemning the church or those in the church. Most never make a transition to the new, and they still have needs to meet. Yet these people will never understand what is happening, and history tells us they will condemn most of what goes on. The activation of the millennial age. You often hear people praying that they would see power like the early church had. Formerly this was impossible, as this early church was a demonstration of the millennial age, not a benchmark for the church age. Now that this millennial age is being entered, the door is open for people to lay hold of what was promised two thousand years ago. Forerunners of the age to come. There will also be a people who are prophesying (through action) into the future, people who will give us a glimpse of what life in the post millennial age will be like. This list doesn’t show some kind of increasing importance. Each has its place. Even the condemnation from the church weeds out those lacking the strength to carry the burden of a heavier calling. The onus placed on you is to know your calling, then work to achieve your destiny, wherever that might place you in the pattern.